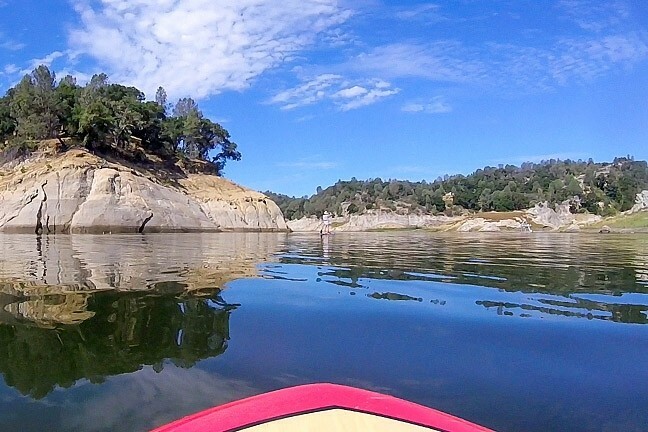 The crusty sand and pebbles that ring around the reservoirs of Lake San Antonio and Lake Nacimiento don’t really paint the picture of a future water surplus, but it could happen. And if it does, Sen. Bill Monning (D-Carmel) is pushing two counties to build something that could take advantage of it. FLOOD CONTROL: Although the water levels in Lake Nacimiento are low right now, recently approved legislation allocates money to build a pipeline between it and Lake San Antonio, for cases when the reservoir is flush with water. The California Legislature recently approved Senate Bill 831, a Monning-authored piece of legislation that grants $10 million for construction of a pipeline—or “interlake tunnel”—between Lake Nacimiento in San Luis Obispo County and Lake San Antonio in Monterey County. Gov. Jerry Brown signed the bill on Sept. 13. According to Sen. Monning, the concept of a tunnel to connect the two lakes has been in discussion since the late 1970s, but it was not until recently that the opportunity to make it a reality presented itself. Annually, the tunnel could create anywhere between 8,000 and 20,000 more acre-feet of storage space for the two lakes, depending on the amount of inflow into Nacimiento. “Additional modeling is needed to get a better handle on the amount of ‘new’ water produced,” said Robert Johnson, deputy general manager of the Monterey County Water Resources Agency. Although it may not seem necessary right now—while California is in the midst of a water shortage—the tunnel’s primary use would be to prevent flooding. Johnson said that the project could be useful now during the drought as well as later when the Central Coast is expected to experience large storms. “The project provides for capturing water in the wet periods to utilizing water in the dry periods,” he said. And ironically, the recent Chimney Fire has increased the potential risk of flooding. Generally, whether the area is in drought conditions or not, Nacimiento holds more water than San Antonio. This means that Monterey County would see a greater benefit from the project than SLO County, as the tunnel would, more often than not, be moving water from Nacimiento to San Antonio rather than vice versa. This has 1st District SLO Supervisor Frank Mecham concerned since SLO County has rights to 17,500 acre-feet of Nacimiento water per year. Mecham also has some more specific worries, including the project’s operations program, the elevation level at which the tunnel will enter Nacimiento, and the fact that most of the affected construction area for the pipeline would be through private property. In contrast, Monning claims that he has not heard any feedback at all from the community in regards to the project. “It may be too early, because it’s still in the planning stage,” he said. There are still many hoops to jump through before the tunnel can become a reality, particularly when it comes to funding. The $10 million granted by SB 831 won’t be enough to cover the $78.2 million that the project is estimated to cost. As of July 31, $3,013 has already been spent on conceptual engineering and acquiring necessary permits. According to Monning, the rest of the money will come from those who will benefit from the tunnel most—namely Monterey County’s agriculture industry. “What we secured was the funding to move this forward at the most rapid pace possible,” he said, referring to the $10 million. There are environmental concerns to address as well. Not only does the project need to get all the usual permits from environmental agencies, but engineers also need to figure out a way to prevent a certain species of white bass from entering the tunnel. Just to put up a screen for these fish is estimated to cost $5 million. “If it comes into the Salinas River, it creates problems because it’s a non-native that preys on smaller fish,” Monning said. Assuming all of the environmental mitigations are dealt with, the interlake tunnel would still need to be funded, most likely through a tax assessment. And that would need to be approved by voters in the affected area, as required by Proposition 218. Depending on how the votes go, the project will either gain the rest of the funding and clearance it needs, or be stopped dead in its tracks. If all goes according to plan, the tunnel would be completed in February 2020. Katrina Borges is a New Times intern. Staff writer Peter Johnson contributed to this article. Send comments through the editor at clanham@newtimesslo.com.